Hawaii’s second largest island is often described as a sun-drenched pacific paradise, so it’s no wonder that many couples find it the ideal place for a romantic proposal. With fabulous scenery, idyllic weather, wonderful food, and a calmer more relaxed atmosphere than islands such as Waikiki, there are plenty of places to propose in Maui whatever time of day you choose. Most visitors head to either West Maui or South Maui for the best locations. Most people would agree that if you want to pop the question as the sun comes up, there’s no better place on Maui to do it than at the top of Haleakala, a dormant volcano in Haleakala National Park. The views from the top are breathtaking, but do be aware that it takes two hours to drive to the top from the coast so you need to plan ahead if you want to be there for the sunrise, which is known as one of the best in the world. Legend has it that the Hawaiian god Maui waited in the volcano’s crater to capture the sun and make it move more slowly through the sky. Hana is another good place to watch the sunrise, especially if you drive or walk up to Fagan’s Cross which is a hill behind Hana with a fantastic view over the town and the Pacific Coast. This is a great option if you’re staying in Hana, but be aware that it can be dangerous to drive the Hana Highway in the dark if you’re coming from West Maui. One of the most romantic ways to propose in Maui is to pack a picnic and head for a secluded beach where you can enjoy snorkelling and swimming before or after the proposal. Ideal beaches in South Maui include Sugar Beach and Kamaole II Beach, while in West Maui Napili Bay is a wonderful choice. Another possibility for a daytime proposal would be to take the fantastic drive along Hana Highway, which takes around two hours from Kahului to Hana. It follows the East coast of Maui winding around mountains and passing black sandy beaches, and there are numerous scenic spots where you can stop to take in the view and enjoy one of the many waterfalls, as well as asking that all important question. Lahaina is a lovely town in West Maui, which is ideal for a more public proposal. You can spend the day shopping along Front Street and work your way up to the wharf where you can take a cruise or simply walk along the seawall before you get down on one knee. Celebrate afterwards with a Mai Tai at one of the picturesque waterfront bars. Maui sunsets are legendary, and can be enjoyed from just about anywhere along the west coast. One of the best options is to take a sunset cruise out from the wharf at Lahaina and make sure you let the crew know you’re planning to propose so they can arrange a little privacy for you. If you’d rather not take a cruise, the sunset is also beautiful from the Lahaina seawall. There are plenty of beaches that are perfect for a sunset proposal, and in South Maui one of the best is Makena Beach. 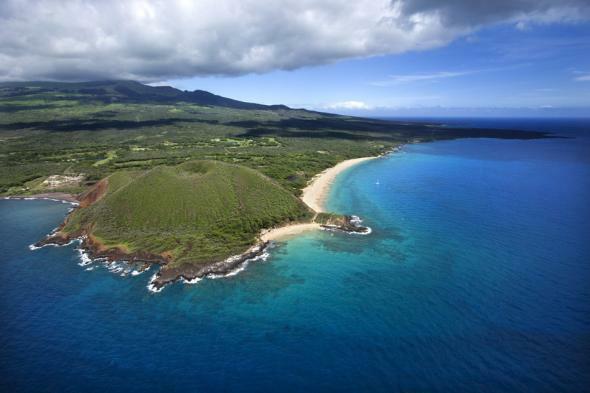 Wailea Beach is also a good choice ideally located between west and south Maui. Kapalua Beach is a good choice in West Maui, or you could consider Kaanapaili which never fails for romance. If you choose Kaanapaili you can snorkel around the coral at Black Rock during the day, pop the question as the sun sets, and then take a romantic stroll north along the beach from the Hyatt Regency to the Sheraton Maui, enjoying the lit tiki torches and the pounding surf.